COOLDO Car Bottom Furnaces is a manual or automated load car to transfer the process large and heavy products into and out the furnace chamber on the rail mounted. According with different heating method, we can do the furnace heating by gas or fuel, and electric. Mechanism: furance body with loade car. Heat Chamber: When we design the heat chamber, we optimize the insulation grade, thickness and density to fit your particular application. The Chamber construction we used all fiber, which can 60% energy saving than the brick and have the wonderful performance of thermal storage. Door Design: The furnace door is typically integral to the car or can be fixed to the furnace body and vertically actuated to seal the chamber.The frame of the door is made by section steel and plate which have stronger rigidity. And inside overlapped the fire resistance fiber. Heating System: If heated by electric resistance wire, The heating element is made by high temperature resistance alloy wire, which distributed at side of chamber, furnace door, back-wall, and car floor. If Heated by gas or fuel, all the burner nozzle arranged both side of chamber. 2), Recirculation fans with high efficiency motors to keep the uniform temperauter inside of Chamber. 3), High-efficiency (gas, fuel or electric) heat sources to reduce energy costs. 4), Stronger structure oven frames and component supports. 5), Application specific state-of-the-art insulation materials are selected to provide optimum insulating characteristics and long term energy savings. 6), Design considerations for easy access to process areas and oven components. 7), Programmable controllers with displays allow for user friendly operation and machine diagnostics. 8), Factory tested to ensure on time delivery and field start up. 9), Factory direct technical service and spare parts group. 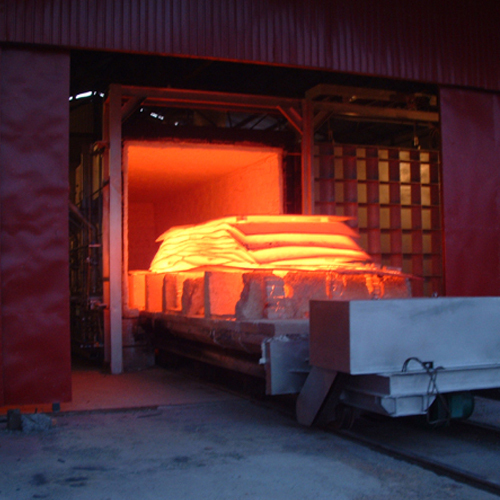 The application of Car Bottom Metal Hardening Furnace is an excellent solution to heat-treat or tempering, normalizing, annealing the large and heavy welded fabrications such as larger casting piece, forging piece, steel billet, steel igot, gear blanks, drive shafts, and similar type products.